STEPANAKERT—The HALO Trust, the world’s largest humanitarian landmine clearance organization, confirmed that three of its staff members were killed and two injured following an accidental detonation of an anti-tank landmine in the Gazanchi area near Martakert on Thursday morning. “It is with profound sadness that we report that three of our staff were killed and two injured, by the accidental detonation of an anti-tank landmine in the Ghazanchi area of Nagorno Karabakh on the morning of 29th March,” said a statement issued by HALO Trust. The organization identified those killed as Pavel Akopov, Samson Avanessian and Marat Petrossian—all citizens of Artsakh. They were in a vehicle conducting minefield survey duties at the time. The injured are currently being treated in the Stepanakert Hospital and HALO has contacted the families in Artsakh of all those involved. “We are working closely with the local police and authorities and have called in external investigators to report on the full facts of the incident,” said the HALO statement. “Every day around the world, more than 8,000 HALO staff go to work in places where no one else can tread and this tragic incident throws into stark relief the dangers that they face and the importance of our work. Our colleagues were killed while working to make the land safe for the people of Nagorno Karabakh,” said James Cowan, HALO’s chief executive officer. Hovhannes Oyunjyan, American investor of Armenian origin, died in Gyumri. He was in the medical center for several days. 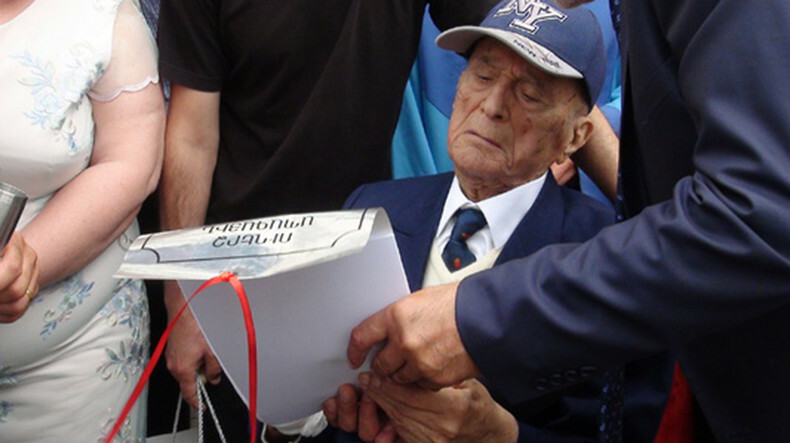 Hovhannes Oyunjyan, a few days ago, on his 98th birthday, made another investment in the Tekstilagortneri quarters of Gyumri, personally taking part in the ceremony of founding the Philharmonic Hall. After the earthquake, the physicist invested all his resources for the development of Gyumri, having built a school, a center of crafts and arts. According to the director of the Oyunjyan Foundation, American doctors forbade him to board a plane, however, with the goal of another charity, he arrived in Armenia. There are the words said by him a few days ago in the video. Armenian doctor, philanthropist Hovhannes Oyunjyan passed away in Gyumri, Shirak province official website reported. Oyunjyan, a New-York-based famous Armenian doctor, marked his 98th birthday anniversary in Gyumri, Armenia’s second largest city, on July 13, where he also attended the groundbreaking ceremony of a concert hall after his name. To note, Oyunjyan who is also honorary citizen of Gyumri, founded the Oyunjyan charity fund in 1988, which has invested 7 million US dollars in Gyumri over the past 20 years. After being renovated in 2000, the Oyunjyan school N21 opened in Gyumri. Vardouhi Art School came into operation in 2014. In 2015 Oyunjyan was awarded with “Poghos Nubar” medal by Armenia’s minister of diaspora for promotion of active connections between Armenia and Diaspora as well as for the great investment in the development of cooperation between Armenia and Diaspora. The crashed S-25 military jet has been found in mountains near the city of Maralik, Spokesperson for the Ministry of Defense Artsrun Hovhannisyan informs. The two pilots - Lieutenant Colonel Armen Babayan and Major Movses Manukyan have been killed in the crash. The military jet of the Armenian Ministry of Defense went missing at 10 a.m. this morning, 14 minutes into the flight. The cause of the crash wasn't immediately clear.